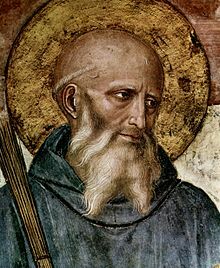 The word Benedictine usually refers to a follower of the Order of Saint Benedict. These people usually lead a life in an abbey. They follow the rule of Benedict of Nursia. Benedict lived in the 6th century. He made some rules, called the Rule of St Benedict these people follow. The rules can be summed up by pax (peace) and ora et labora (pray and work). Most Benedictines see themselves as part of the Catholic Church. Some can also be found in the Eastern Orthodox Church and the Anglican Church. Officially, the order is known as Ordo Sancti Benedicti (OSB). This page was last changed on 17 October 2014, at 11:50.